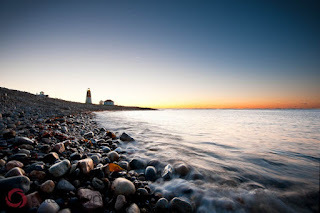 Also on my list of places to visit has been Point Judith Light for a morning long exposure shoot. After coming across, greatly admiring, and then meeting seascape photographer Ed King of 02809 Photography, I have been deeply inspired to further practice and refine my own seascape shooting. I headed to PJ the morning after our first frost. I headed down the beach to find my best vantage point. Although I would have preferred low tide, it was unfortunately peak high tide when it was time for the sun to break the horizon. Here's my happy result though! I'm waiting on my Graduated ND filter in the mail so this was a composite to combine sky and foreground exposures. I was using my 16-35mm at the lowest ISO possible! By the time the sun was breaking the horizon I was well into fractions of a second instead of the preferred 1 second or longer. I'll be sure to revisit for low tide and with a new filter and see how different of a shot I can make!